Gay Marriage in Kenya | Hujambo! There was a big huzzah in Kenya a few weeks ago when pictures circulated of two Kenyan men in the UK getting married. I got the e-mail from a colleague at work and had assumed it had made its way around ILRI, but then I saw it being actively discussed in several editions of print and online media. It’s safe to assume the e-mail made its way to every single office-working Kenyan in Nairobi now that I think about it. I don’t own a TV but it was probably even on the evening news. The subject of the e-mail was “Dunia inaisha” (the world is ending), which is pretty hilarious. That’s like the Obama haters who said jihad will come to America if he is elected president. Now imagine my surprise when I was walking through Gikomba (the hawkers’ market) and saw this camouflage-colored hat with the words “Gay Marriage” written in pink text. Haha! I had just bought a pair of used Converse, a t-shirt, and a pair of shorts, when I came across this awesome hat. I snapped a picture of it real quick before the shop keeper saw me, but then I just had to ask him, “WTF? Will anyone buy this in Kenya?” Maybe he’s a supporter of gay marriage (in which case I should have bought the hat), or more likely, he just picked it out of a bin wherever it is that he gets his wares. 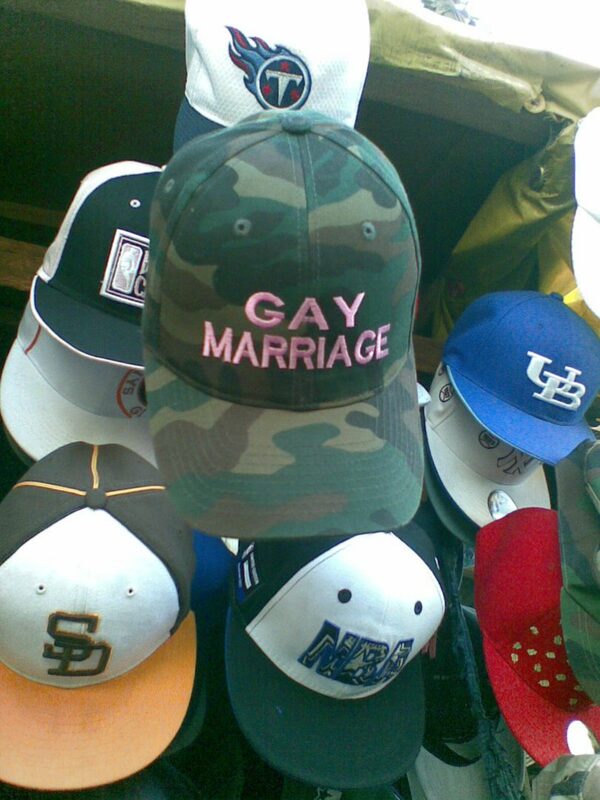 A “gay marriage” army hat makes about as much sense to me as American flags being made in China. By the way, extra points for anyone who noticed the old school San Diego Padres hat in the same picture. You should send the picture to David Letterman or Leno! yeah, alan, this is really funny to me too! sema mlami mjanjez(street smart white dude) Imagine I just stumbled on the blog and believe me…I havent stopped enjoying myself, completely…bigups!! !